Can I send you video or previously transferred film for restoration? – If the subject matter is of Disney theme parks and pre-dates 1995, then we would be interested in seeing your footage for evaluation and possible restoration. Can any film/video be restored? – Yes and no. The old adage of “Garbage in…Garbage out” is very true here. Videos that have already been compressed, re-compressed or re-sized are often so full of artifacts (side effect of compression methods) that running the filters and software may produce even worse results. It is best to start from the original film or video tape if you have it, and then go from there. How long does a restoration take? – This depends on the quality of the original film/video and its length. Generally speaking about an hour or so to tweak all the scripts; longer if the source is of poor quality. From there its up to the computer to do its magic. Most projects will clean and render between 4 and 6fps, so 30 minutes of film would take 2-4 hours to restore. Add another 20-60 minutes or so to encode into H264 format for usage for streaming. Can I download your restored films in an uncompressed format? – No. We only share them on our Vimeo and/or YouTube Channels or with the original owners. How can I be notified of newly completed projects? 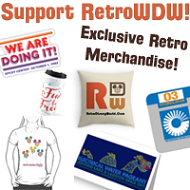 – Follow us on Twitter, Facebook or retrowdw.com!